New Functions for the iPhone This Week? "Today is the day! We just fixed up our issues with the toolchain and are proud to announce the GUI version as the latest greatest opensource tool." Just install this application on your phone and run it from Springboard. Enjoy! Link: Free Unlock GUI - Now Finally Released! "Aptly named Simplify Media recently launched a native third-party iPhone application that can stream music from any enabled Mac or PC (also running the Simplify Media software) directly to the iPhone over a WiFi or EDGE connection. Once you've made your iPhone ready accept third-party applications, the process for setting up Simplify Media is, well, simple...."
"Almost lost in yesterday's tech news was Google's announcement that it has released an application for the iPhone that consolidates several of its Web services such as e-mail, search and calendar functions into a single interface. "Owners of an iPhone (or an iPod touch) need only visit Google.com to access the new goodies; no download is required. A single Google software engineer, Steve Kanefsky, envisioned the feature after being impressed with the iPhone's large touch screen as well as the inclusion of the full Safari Web browser." "The app makes it easier to use and switch between Google's e-mail, search and calendar services on the iPhone." "The optimization of Search, Gmail, Calendar and Reader for the iPhone is the latest step in Google's mobile march." "About one in five poor people have only cell phones, about double the percentage for those who are not poor." "While Apple's iPhone this year captured the imagination of the US market and spurred a global diagoue about the future of smartphones, it's not taking Europe by fire in the sales department. In fact, if my colleague Eric Zeman is right, the iPhone could be a flop in Germany. What gives? "But, I wonder if the real reason the iPhone is flopping in Europe is that the iPhone has simply jumped the shark." Link: Has the iPhone Jumped the Shark? "Some webpages are organized into frames, where each frame displays a different web document. You can use Safari to browse and scroll through web pages containing frames by using two fingers simultaneously. When you use one finger to flick or drag up or down, you are scrolling through the web page. When you use two fingers to flick or drag up or down, you are scrolling through the frame. "Note: On a computer you will be able to scroll through such frames using a scroll bar." "According to various rumours, it is next Saturday which the new firmware should arrive for the iPhone. This version 1.1.3 would bring two great innovations: a dictaphone function and the possibility of using the APPLE telephone like a hard disk. "The advertisement of the near release of a iPhone 3G made early adopters of the first version of the Apple telephone grimace. But they can be comforted by thinking that in a few days, their telephone will be enhanced by two new functions." Link: De nouvelles fonctions pour l'iPhone dès cette semaine ? "By using the SvSIP software for the Nintendo DS provided by Samuel Vinson, a developer identified as 'Eok' has created a semi-working VOIP client for the iPod touch...."
"Amazing news, guys! I have no words! We all knew it will come. "So here it is: eok did manage to make the Nintendo DS-based SIP app from Samuel running on the iPod touch!!" "Since the debut of the iPod touch, we've all pretty much known that it's strikingly similar to the iPhone in more ways than Apple would like us to believe. For one, they can run the same apps (including iPhone-specific ones, like Mail, Weather, and Stocks). That list also includes recording audio-in. Yes, you read that right--the audio-in line, which is used for phone calls in the iPhone, is not disabled in the iPod touch, as several observant tinkerers have discovered." "With an excellent interface and elegant design, the iPod touch is simply the best portable media player ever made." "The new Zune is trimmer, has a larger screen and increased capacity. Add its wireless abilities to the equation and you've got a player that (gasp!) trumps Apple's iPod classic." After updating an iPod classic or an iPod nano (3rd generation) to iPod software 1.0.2, the device may continuously reboot after resyncing iTunes music library. If this occurs, the iPod will not be recognized or seen in iTunes. To resolve this issue, place the device in Disk Mode and restore it. See this document for steps to put the iPod into Disk Mode. If you need assistance restoring the iPod, see this document. To prevent this issue from recurring, recreate the iTunes music library prior to resyncing the iPod. See "How to re-create your iTunes Library" for information. PR: Tired of how slow your iPhone connects to the internet? Wish you could blaze along at true 3G Speeds? Jump off the EDGE and easily connect to high speed EVDO networks by using the new CradlePoint PHS300 Portable HotSpot! The PHS300 allows you to share the connection from an EVDO USB modem via WiFi, allowing your iPhone or iPod touch to connect to the internet at faster EVDO broadband speeds where coverage is available! The PHS300 is also the first 3G router to have a built-in rechargeable battery, allowing freedom you've never experienced before. "So, I got curious after work one day and decided to figure out how to write a simple MobileSafari plugin. This took me 3 days. "This one lets you download most zip and tar files. I tried to make it download png, gif, and jpgs, but because Safari handles it already, I don't think I can ever make that work. "This was developed targeting 1.0.2. I haven't tried it on 1.1.1 or 1.1.2. "(Updated) XianLi says in this thread that it works fine for him on 1.1.2. "No warranty or liability of any kind, of course. Don't blame me if it somehow messes up your data, though it isn't supposed to affect anything outside the Downloads folder it created. "Copy the plugin bundle into '/System/Library/Internet Plug-Ins', and then reboot the phone. "It will create a folder called Downloads next to Library and Media in your root home folder. It will only download there. "When you click on a link that is downloadable, a large button will appear. Click on it to download. Click the normal page back button to not download, or to go back when it's complete." PR: iSpeak It is a file-to-audio converter that serves as a perfect companion to the iPod or iPhone. iSpeak It loads Word, PDF, Pages, RTF, AppleWorks, text and HTML documents. It downloads news, weather forecasts, driving directions, and arbitrary web pages as well as RSS feeds. iSpeak It then uses the Mac's text-to-speech engine and iTunes to convert the text into an MP3/AAC track. Version 3.3.3 fixes News and RSS downloading under Tiger and provides other minor bug fixes. ZappTek announces its very popular file-to-audio tool, iSpeak It 3.3.3. Load Word, PDF, Pages 2, RTF, AppleWorks, Text, HTML documents or RSS feeds, and using the Mac's built-in text-to-speech capabilities, convert them into MP3/AAC tracks in iTunes. From there it's a quick sync to iPod or iPhone. Download RSS feeds and keep track of local weather with up-to-date forecasts. Download news articles from news.google.com and hear them on the way to/from work. Download driving directions and listen to them on iPod or iPhone. Users may open any text document or select any text and load it via the Services menu. A toolbar provides easy access to all of the load menu options and the transferring of a document to iTunes. Mac OS X version 10.4 or higher. To install iSpeak It, drag it to your Applications folder or wherever you'd like to keep it. Before transferring any text, use the Speech panel in the System Preferences to select the voice to use during conversion. iSpeak It uses the voice and defined settings for all of its processing. Experiment with the voices to see which sounds best. iSpeak It also provides advanced text replacement capabilities. There are a number of phrases that Mac Voices will not convert properly. iSpeak It can define rules that identify problem words and an appropriate (phonetically correct) replacement for them. It will even automatically apply the rules before transferring a document to iTunes. iSpeak 3.3.3 remains priced at $19.95 with free update for existing users of version 3.x. The iSpeak It trial allows for converting the first 1000 characters of any text. Users may purchase the bundle, which includes iPresent It and iPDA, for $44.95 ; a $13 savings. Users can purchase from within iSpeak It by selecting "Purchase iSpeak It..." in the application menu or visit the ZappTek website. PR: Voodoo Ergonomics Inc. announces the release of Mojotones 2.0 for Mac OS X. Mojotones is an easy-to-use utility for the creation of ringtones from audio files. Users may send the whole track - or a favorite part of it - to their phone. Mojotones is Universal Binary requiring Mac OS X 10.4.9 and a phone capable of playing MP3, AAC or WAV files. Voodoo Ergonomics Inc. announces the release of version 2.0 of Mojotones, an easy-to-use solution to create ringtones from their tracks. Users may send the whole track - or their favorite part of it - to their phone. With Mojotones, users may use the tracks in their iTunes library or anywhere else as ringtones on their phone as easily as choosing the song and clicking a button. Mojotones is a Universal Binary, so it works great on both Intel and PowerPC Macs, and can use Bluetooth to send the tracks directly to your phone. For those without a phone capable of Bluetooth transfers, Mojotones can save the ringtone to a file directly on the phone (via a USB cable or media reader). If you choose to create an iPhone ringtone, it's added to iTunes, ready for your next sync. Just find the song you want and click the Send button. That kicks off a file transfer or save operation - no costly SMS messages or downloads from the phone company. Navigate through your phone's menus to set the ringtone. Want only part of the song? Just click the Play button then drag the sliders around. Want finer control? Use the Control menu shortcut keys to nudge the ends of the range. When you have just the right part selected, send it to your phone. It's that simple. Easy creation of iPhone ringtones. Range duration display in the player. Support for MP3, AAC and WAV ringtones. Ringtone transfer via Bluetooth or save to a file. The ability to open tracks in a folder on the file system. No costly SMS messages, or downloads from the phone service. * Pinpoint editing of music track selections. Universal Binary: Works great on both Intel and PowerPC computers running Mac OS X.
iPhone ringtones require firmware 1.1.2 and iTunes 7.5. Mojotones 2.0 can be purchased from the Voodoo Ergonomics' secure store for $19.95 per user. Demo is also available for download. 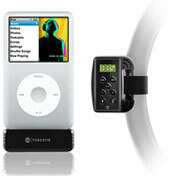 PR: Meet TuneStik - the most versatile iPod accessory in DLO history. TuneStik combines a wireless FM transmitter with a powerful RF remote control for iPod playback and control in the car, at home - anywhere there's an FM radio. What sets TuneStik apart from the pack of existing FM transmitters is the included remote control plus an integrated pass-through dock connector, which gives you the freedom to combine TuneStik with virtually any iPod accessory - adding an RF remote and an FM transmitter to nearly all your iPod gear. TuneStik includes a compact RF remote control and steering-wheel cradle, so you can put safety first as you control your iPod. The remote control pops out of its cradle in a snap, allowing you to pass music control to your back seat drivers. And with four programmable presets and digital display, setting and using your favorite frequencies is simple and safe. TuneStik isn't just an FM transmitter for the car - it also adds a strong RF remote control to your iPod - anywhere! 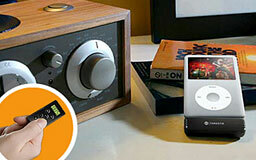 With your TuneStik attached, simply connect your iPod to your home stereo system. Now you can use the compact TuneStik remote to control your iPod audio playback from across the room. With TuneStik's pass-through bottom dock connector, you can continue to use your existing Auto Charger, iPod dock, or any other 30-pin based accessory while still having the benefits of a powerful FM transmitter and remote control at your fingertips. 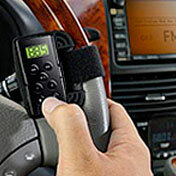 Compact RF remote for easy iPod playback control from up to 25 ft.
TuneStik is a complete kit that includes a powerful FM transmitter module, compact RF remote control with digital display, fully adjustable steering-wheel cradle, and a manual to get you going in five easy steps. Whenever there's a radio nearby, grab your iPod and be the DJ with the TuneStik with remote. PR: iPDA is the perfect companion to the iPod by serving as a replacement PDA. Word, PDF, Apple Pages, RTF or text documents may be easily transferred to iPod so data is available for quick access, any time. iPDA now supports Leopard specific synching for Mail, iCal and Address Book, including Mail Notes and To Do's, as well as a large number of changes to its feature set. Version 4.0.2 fixes News and RSS downloading under Tiger, Gmail password saving under Tiger, and Direction transfer problems. iPDA is the perfect companion to the iPod by serving as a replacement PDA. Word, PDF, Apple Pages, RTF or text documents may be easily transferred to iPod so data is available for quick access, any time. Download RSS feeds, weather forecasts, driving directions and news headlines directly to the iPod. iPDA supports transferring information from Entourage, Stickies, Mail, Address Book and iCal, making it simple to put the information users need on their iPods. Version 4.0.2 fixes News and RSS downloading under Tiger, Gmail password saving under Tiger, and fixes Direction transfer problems. Sync Mail Notes and To Do's directly to iPod. Download news articles from news.google.com and read them on the way to/from work. Subscribe to published iCals and download them directly. Download driving directions directly to iPod. Perform a backup to iPod. Gmail password saving under Tiger. Mac OS X version 10.3 or higher. Microsoft Entourage for Entourage data synchronization. Web Services require an Internet connection. To install iPDA 4.0.2, drag it to your Applications folder or wherever you'd like to keep it. Clicking on a button will bring up a window to select the specific subset of information to export to your iPod; each window contains basic guides on its use. Determine the settings needed for synching and click OK.
iPDA 4.0.2 remains priced at $19.95 with a $10 upgrade fee for current 3.x users (and a free update for version 4 users). The iPDA trial allows for 6 full synchs before requiring a purchase. Users may purchase the bundle, which includes iPresent It and iSpeak It, for $44.95 ; a $13 savings. Users may purchase from within iPDA by selecting "Purchase iPDA..." in the application menu or visit the ZappTek website.